Early Snow at Logan Pass, 10x12, $2400. private collection. As an artist, I get asked all sorts of questions about how to buy, what to buy, and when to buy a piece of art. Many first-time collectors are shy or do not even really know what to ask. Here are 10 of the questions I answer most frequently. Q: I’m a new collector. Should I buy art as an investment or just get something I like? A: Buy what you LOVE! When it comes to buying art as an investment, things can go wrong. Lots of people really get into that part of it, which is fine. Just remember, you are taking a gamble that may or may not pay off. Always buy what you absolutely love without regard for the artist’s latest award or magazine cover. (I have NEVER been on a magazine cover! It doesn’t make or break you.) But if you buy what you LOVE, at the very least, you will have something that makes you happy to look at every day for the rest of your life. Art should be a quality-of-life purchase. If it relieves your stress, makes you smile, causes you to pause, forces you to think, or brings you good vibes, buy it. If it doesn’t match your sofa, get a second painting that doesn’t either. Your guests would much prefer to hear all about your latest acquisitions and why you chose them. Q: Will the pieces I have purchased in the past continue to appreciate in value? A: In the best of all possible scenarios, YES! Most of the pieces you purchase do appreciate to some degree or other. Unfortunately, as I mentioned before, it is a gamble that is not always dependent on the quality of the artwork. It is also based on the trajectory of the artist’s career. (Sad, but true.) As I said above, worst-case scenario, you have a lifetime of happiness looking at the pieces you have purchased. For the sake of this discussion, let’s take a look at one of my paintings. Based on the retail value of $8000 today, at a conservative rate of appreciation barring any unforeseen circumstances, that same work of art will be worth $22,000 in 10 years. But I’m an eternal optimist so consider this: increasingly, wonderful opportunities will continue to come my way and the quality of my work will only get more and more intelligent. Now, instead of a 10% per year return on your investment, you are looking at a return of 10 times what you paid within my lifetime! I can also be a realist. One day I will die. Who knows what that painting will be worth to your children or grandchildren? Up She Rises, 18x24, $4500. Available through LeQuire Gallery. Q: I’ve been collecting a while, and have noticed that many of the pieces I bought years ago are worth more money now. This has me thinking about insurance and how to take care of my investment. What do you advise? A: Congratulations! You need to have an honest conversation with your home insurance provider every few years or new purchase, whichever comes first. Fire is the most common reason for loss of a collection in your home. Be sure to take good inventory notes, ask artists for Certificates of Authenticity for each piece you own and store those in a safe. No one wants to think about tragedy and monetary value, but it happens. 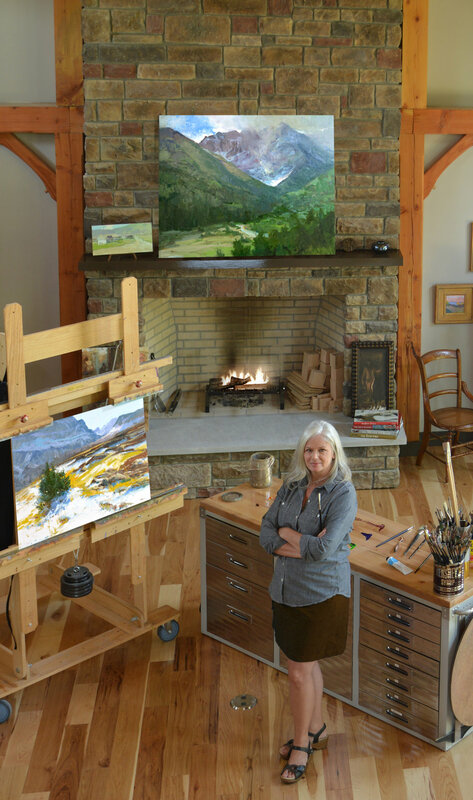 Q: What makes you feel comfortable charging what you do for your paintings? A: Comfortable? Hmmmm... that’s an interesting way to put it. What I will say is that my work is very modestly priced (right now). Important exhibitions, museum recognition, high-dollar purchase history, accolades, all add to an artist’s career. The bottom line, it’s a long road and a lot of work to get to the top tier of pricing... I have friends bringing $250,000 and up for a large work. Back in my little corner of the market, you may be surprised to learn that galleries receive 40-50% of the sale (depending on the contract). Galleries are giving up expensive retail space, paying for advertising, hosting openings, working with clients, and putting up with us, the artists. That $8000 painting mentioned above? Yep, I paint it, frame it, crate it, ship it to the gallery, and when it sells, get my percentage of the cut. The gallery keeps the rest. I have no problem charging what I am currently charging, and I’ll have no problem increasing those prices in the near future. Q: Should I try to buy directly from you and save money? A: No. First of all, I have limited inventory available at my place. It does me no good to keep paintings sitting around. (Occasionally, someone stumbles on a brand new piece online that hasn’t even been framed yet. I am happy to sell it to you unless it is spoken for elsewhere.) Secondly, undercutting a gallery is the worst thing an artist in the business can do. And third, if I do not respect my work, why should you? It is not just my passion; it is my life’s work... it’s my living. Would you call your physician’s home and try to get a discount? There is one exception, and I am up front about it with my galleries. During my workshops, pieces of art may be for sale in my studio. Some of these prices will be discounted. Additionally, VIP collectors of my work get a special shipping discount or loyalty discount, much like a gallery might do. I can only do this because the pieces are typically either older works that my galleries have no room for and put out to pasture (i.e., sent back to me), or they are only small sketches or class demos that are not complete enough to send to a gallery in the first place. Are they bad paintings? Gee, I hope not. But no gallery wants them and I only have so much room, so I have the right to sell them. Most of them are sold unframed (cost savings to you) and at a small discount as a thank you to those who collect my work and take my workshops. However, the beauty of buying from one of my galleries, is that you get first pick of the newest pieces, elegantly framed, and sometimes they will even hand-deliver it and hang it for you! If you see something on my website that you want, email me. I will put you in touch with the representing gallery’s director. Deal with galleries when you can; grab the painting you love; do not risk losing a painting by waiting for a sale. 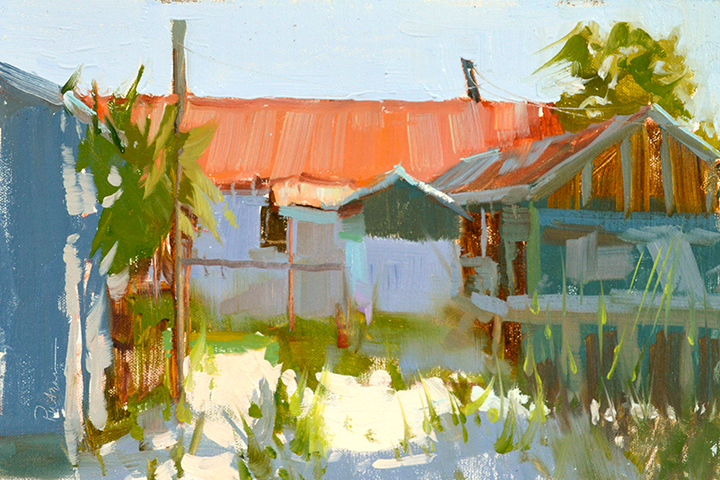 Seafood Shack, 8x12, $2200. Available through LeQuire Gallery. Q: I’m not sure I can even afford to collect and I’m too embarrassed to ask. What is the best way to find out? A: First of all, we all feel the same way. Personally, often it is difficult for me to get up the nerve to ask about a price on a piece of jewelry when the store has all of the tags turned upside down. “You can’t afford it if you have to ask,” runs through my brain. Go to the internet. Research some artists whose work you really like. Chances are you will find some place online where a price or two has been listed. More and more these days, artists and galleries are posting prices for you to see. Mine are listed on my website. Just click on a painting and hover your mouse over it for the details to appear. Better yet, just ask... start a conversation... great things happen when you do. Above all, do not be discouraged if everything you find is out of reach. You have great taste! Did you know that many galleries and artists offer payment plans? Do your best to buy the painting you want... remember that quality-of-life thing I mentioned earlier? Q: I’m not sure if what I want will fit in the space I have. How do I know it will look perfect? A: I keep beating this same drum, if you love it, find a place for it. However, assuming you live in a one-room walk-up and are crammed like spam, galleries and artists will work with you to be sure it is the right piece for the right place. Maybe you have a huge wall in a castle and you’re not sure the painting will be large enough. Some artists take commissions. Either way, working with a local gallery to locate the piece (even if it is in another gallery thousands of miles away) or coordinate the commission, means they will likely also offer to hang it, let you live with it a day or two, and turn your security deposit into a purchase when you confirm it’s absolutely perfect. Q: I only buy artwork from the artist if I can meet them. Will you be in my area any time? A: Ok... so, I hate to be so blunt, but you are missing out on a lot of good paintings by sticking to your guns this way. “Purchase pride” may mean the perfect piece goes to someone else. Still, for more expensive purchases, yes... I will happily come for a visit or, even better, schedule a private dinner for YOU in my studio. I like relationships too, and knowing where my pieces are means as much to me as it does to you. All you need to do is ask. Q: I love the painting but I hate the frame? Will you give me a discount? Q: Do you charge per size? I see one painting that is $6700 and another that is $8200 and they are the same size. Why is this? A: When I first began, I charged per square inch. That’s a good starting place for an artist just breaking into the biz. This is no longer the case. There are many factors that go into pricing a painting. Sometimes it has to do with the cost of the frame and the contract with the gallery. Remember that the gallery takes 40-50%. So, if I pay $1000+ for the frame, I have to mark it up or I go in the hole for it. Different frames cost different amounts. And that beginning artist I told you about? She bought the least expensive thing that looked “okay” and did not mark it up at all, (lost money on it), just to get a start on a collector base. You’re welcome. In the end, “LOVE it” should be your take away from all of this. Money, investment, size, frame, and the color of your sofa should not carry much weight, if any at all. If you have any other questions I can answer, please send me a note. I’d love to clear the way for you to add to (or begin) your collection.